Tony Blair’s Faith Foundation received money from a financial fraudster linked with illegal Israeli settlements and an American Islamophobic network. Tony Blair is again in the headlines, this time after Labour leadership frontrunner Jeremy Corbyn publicly voiced the opinion of millions of British citizens: that the former prime minister should stand trial on charges of war crimes if the evidence suggests that he broke international law during the 2003 invasion and occupation of Iraq. Blair’s conduct since leaving office has received less scrutiny, however. 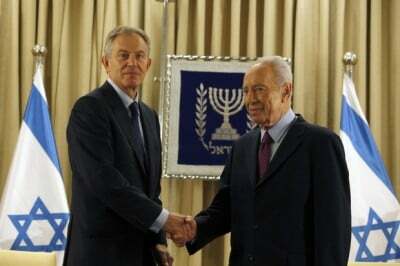 Our investigations show that while Blair was serving as the special Middle East peace envoy of the Quartet, representing the UN, US, EU and Russia, the American fundraising arm of the Tony Blair Faith Foundation accepted money from a family that finances illegal Israeli settlements via the earnings of a convicted felon. While conducting research on the transatlantic funders of the occupation in Palestine, to be published by Public Interest Investigations later this year, we uncovered tax documents revealing that the California-based Milken Family Foundation donated $1 million to the Tony Blair Faith Foundation in 2013. The Milken Family Foundation’s director is Michael Milken and its president is his younger brother Lowell, who is also president of another family foundation, the Lowell Milken Family Foundation, registered at the same address. Michael Milken, with the legal assistance of his brother Lowell, is known for having developed the market for high-yield and high-risk bonds in the 1980s, earning him both billions of dollars and the nickname of “Junk Bond King”. In 1990, he pleaded guilty to six felonies and agreed to pay $600 million, including $200 million in fines, to settle what The New York Times had called “the biggest fraud case in the history of the securities industry”. Milken was sentenced to 10 years in prison, but served only 22 months. According to Mother Jones magazine, Lowell was also indicted on federal racketeering and fraud charges connected to insider-trading violations at Drexel Burnham Lambert, the now-defunct Wall Street investment bank where both brothers worked. However, in order to get Michael to accept a plea deal, the charges against Lowell were dropped. The magazine further notes that the collapse of Drexel Burnham Lambert and a number of other savings and loan partnerships (many of them affiliated with the Milken brothers) fuelled the larger savings and loan crisis between 1986 and 1995, creating an economic recession and costing American taxpayers about $500 billion. But despite his criminal record and legacy, Forbes magazine estimates that Michael is currently worth $2.5 billion, making him the 737th richest person in the world. Lowell’s real estate investments helped to make him worth $1 billion in 2008. Back in 1984, he even paid $975,000 in cash for a two-story beach house in Malibu with five bedrooms and four baths. In recent years, the Milken brothers have focused their attention on philanthropy, working on a wide range of causes, several linked to pro-settler and Islamophobic groups. For example, between 2009 and 2013, the Lowell Milken Family Foundation funnelled $607,000 to the Ariel settlement in the central occupied West Bank, either through the tax-exempt charity American Friends of Ariel or directly to the Ariel University Center of Samaria. Indeed, Lowell Milken’s contributions to the illegal settlement are so important that the Friends of Ariel website has dubbed him ‘Ariel’s Celebrity’. According to the Tampa Bay Times, Aish HaTorah has close ties to the virulently anti-Muslim Clarion Fund, which is behind the notorious anti-Islam film Obsession: Clarion’s address, according to Manhattan directory assistance, is the same address as Aish HaTorah International, the group’s fundraising arm. This is not the Milken family’s only link to the “Islamophobia network”. Another anti-Muslim cause funded by it is CAMERA, an organisation based in Boston that claims to monitor American media coverage of Israel, but which according to a 2015 report published by the International Jewish Anti-Zionist Network in reality “is an Islamophobic watchdog organisation that bullies media outlets into producing pro-Israel coverage”. The Milken family foundations have also given a substantial amount of money to MEMRI, founded by Yigal Carmon, a former Israeli military intelligence officer, and Meyrav Wurmser, an Israeli-born American political scientist, to provide free English language translations of Arabic, Persian, Urdu, Pashto and Turkish media reports. The Center for American Progress has called MEMRI “the Islamophobia network’s go-to place for selective translations of Islamist rhetoric abroad”. One of its directors is Steve Emerson, a media “terrorism expert” who in January 2015 falsely told Fox News that Birmingham is a “Muslim-only city” where non-Muslims “don’t go”. The subsequent public outcry forced him to apologise. Other recipients of the Milken brothers’ crooked fortune include: Friends of the Israel Defense Forces, the largest international donor of Israel’s occupation forces; Jewish National Fund, tasked to secure the Jewish stewardship of Palestinian lands; and Zionist Organization of America, the US branch of the World Zionist Organization, which according to The New York Times has played a key role in managing land and infrastructure in Israeli settlements. Of course, these financial connections are not the first controversy surrounding Blair’s faith foundation. Last year, Martin Bright, a former website editor for the Tony Blair Faith Foundation, complained that “Blair continues to use a ministerial-style ‘red box’ for his urgent correspondence and was a strong presence at the charity,” leading the UK Charity Commission to examine the allegations. Bright also criticised the foundation’s decision to accept funds from an organisation linked to Saudi Arabia’s repressive regime. Blair’s role in the illegal war in Iraq may yet be uncovered; however, the full range of his current international networks needs much fuller investigation. Sarah Marusek is a freelance researcher and writer for Public Interest Investigations/Spinwatch. She holds a PhD in social science from the Maxwell School of Syracuse University. David Miller is co-founder of Public Interest Investigations/Spinwatch and Editor of Powerbase, a wiki that monitors power networks. He is Professor of Sociology at the University of Bath and co-author of A Century of Spin: How Public Relations Became the Cutting Edge of Corporate Power. 2008, Pluto and The Cold War on British Muslims: An Examination of the Policy Exchange and the Centre for Social Cohesion. 2011, Public Interest Investigations.